Avo­ca­do, cucum­ber, aspara­gus roll topped with seared tuna, house­made tata­ki sauce, roast­ed gar­lic chips & green onions. 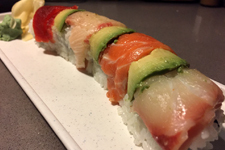 Cal­i­for­nia roll topped with tuna, yel­low­tail, salmon, white fish and avo­ca­do. Repu­ra soft shell crab, avo­ca­do, cucum­ber, pick­led bur­dock root, tem­pu­ra crunchies and eel sauce. Shrimp tem­pu­ra, avo­ca­do & cucum­ber roll, topped with scal­lops, spicy mayo and baked, gar­nished with sir­acha, green onions, ponzu and boni­to.